Purple Custard apples are medium to large in size, averaging 8-16 centimeters in diameter, and are round, heart-shaped, or oblate with a slightly lopsided appearance. The thin, semi-smooth skin is resilient and strong and ranges in color from dark purple to red with a rough, thick brown stem attached to the top-center of the fruit. Underneath the skin, the dense, lightly granular flesh is moist, creamy, and contains many hues of purple, pink, white, and red. There is also a central, fibrous core that tapers through the center of the fruit and depending on the variety, the flesh may contain many black-brown, oblong seeds or be found seedless. 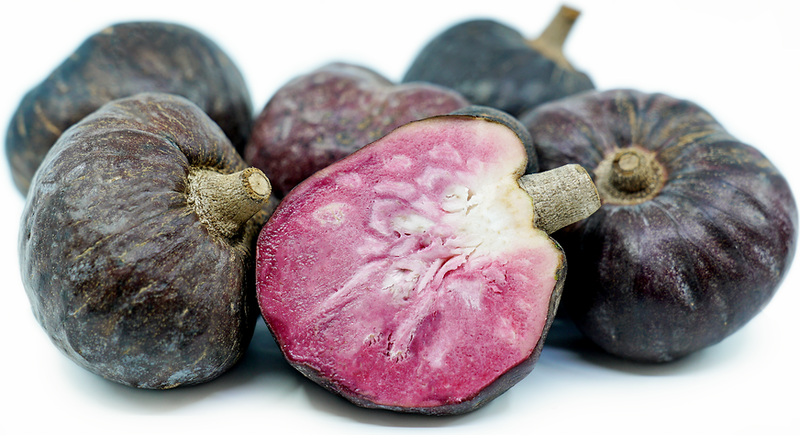 Purple Custard apples have a custard-like consistency and a mild, sweet flavor with subtle notes of vanilla, pear, strawberry, and raspberry. Purple Custard apples are available in the late winter through spring. Purple Custard apples, botanically classified as Annona reticulata, grow on leafy trees that can reach up to ten meters in height and belong to the Annonaceae family. Found in tropical climates that have periods of cooler weather during the winter, Purple Custard apples are a close relative to the atemoya and sugar apple and are largely found in the Caribbean and Central and South America. While somewhat mild and bland in taste, Purple Custard apples are favored for their marbled, bright purple-white flesh and are commonly used for fresh eating. Purple Custard apples contain calcium, iron, vitamin C, fiber, magnesium, phosphorus, and potassium. Purple Custard apples are best suited for raw applications as their creamy flesh is showcased when consumed fresh, out-of-hand. When ripe, the fruit can be sliced, or hand torn into halves and scooped out with a spoon. In addition to fresh eating, Purple Custard apples are most commonly added to fruit juices, ice cream, milkshakes, custards, and puddings. The mild, sweet fruit is recommended to be served chilled and can be topped with light cream, condensed milk, or sugar to enhance the flavor. It is not recommended to cook the fruit, but pieces of the flesh can be added into curries, stir-fries, and cooked meats at the very end of the cooking process. Purple Custard apples will keep for a couple of days at room temperature and once ripe, they can be stored in the refrigerator for an additional three days. Purple Custard apples are not commercially cultivated on a wide scale, but they are favored in the Caribbean, especially in Jamaica for fresh eating. In Jamaica, Purple Custard apples are a popular home garden, backyard fruit and are also found growing wild in the countryside. Many locals remember enjoying the mild, sweet fruit out-of-hand as a sweet treat or mixed into Jamaican custard apple pie pudding when they were children. Custard apples, in general, are also used medicinally in Central America, and unripe fruits and bark are believed to help reduce symptoms of dysentery and diarrhea. In addition to digestive issues, the root bark is ground and placed around gums to help relieve toothaches. Custard apples are believed to be native to tropical regions in the Caribbean and Central America and have been growing wild since ancient times. The fruits were then transported through Mexico and down into South America to Brazil and Peru and were expanded out via trade routes and expeditions to Southeast Asia, Australia, and Africa before the mid-17th century. While the exact origins of when the Purple Custard apple variety was developed is unknown, experts believe the dark-hued fruit came from Mexico and was planted in the Caribbean and Florida. Purple Custard apples are found growing in the wild and are available at fresh, local markets in Australia, South Africa, the Philippines, Guam, Taiwan, India, Pakistan, Bangladesh, Ecuador, Guatemala, the Caribbean, Mexico, and in Florida of the United States. The Purple Custard apple shown in the photo above was found at a market in Florida.